It’s been a see-saw battle so far, but with 3 days and 4 hours left John P Stevens High School (13,068 points) has clawed the lead back from North Point High (9,677) and Life In Pixels (9,230 points), while Power On, which has been strong all year, is nonetheless lingering in fourth (5,691 points). Check out all the action here. Who will win the Media League title? Fans are signing up in growing numbers and the scores are rising. The winning school will be the one who drives hardest to the finish line, promoting their awesome media as widely as possible. Why should the football team get all the fans? Go Media Teams go! Meanwhile, just an hour ago the John P Stevens Media Team uploaded their 3rd and final Game Media to the Championship Game, whose theme is LOVE. As always, their work is well worth checking out. So let’s check it out! John P Stevens High School is based in Edison, New Jersey and all season long its Media Team has been active and impressive. The team has 10 members, including the formidable talents of Chit Y, Dennis, Vincent, Siddhi D, Harsh, Pooja P and Keyang H, and is coached by Alison Paolello and Assistant Coach Sami B. 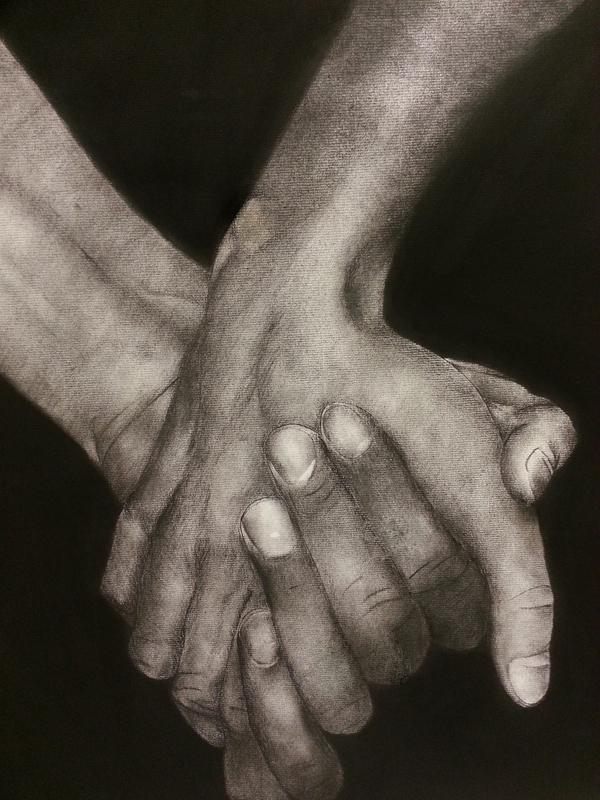 Among John P Steven’s entries in the Championship Game is a charcoal drawing called Lovingly Holding Hands which – as some commentators have pointed out – is so realistic that the thumbnail looks like a photo! Holding hands is one of the simplest acts of affection. Even chimpanzees do it! The stark black background and subtle shading really gives these hands a sense of depth and gravity. Wicked! 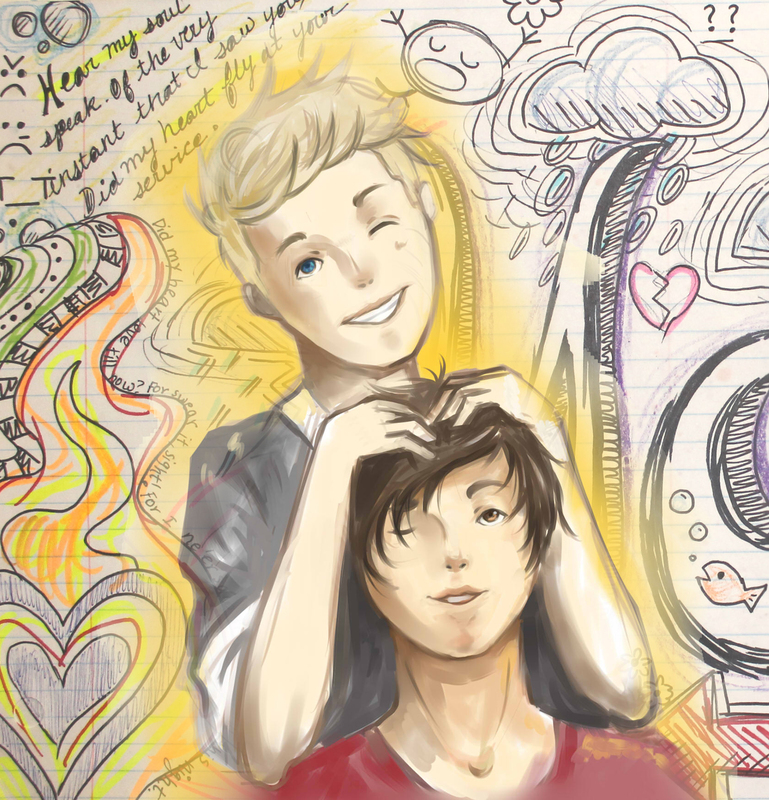 The second piece from JP Stevens is simply titled Love, and it is a playful double-portrait that is full of joy and – well, love! We don’t know who these two characters are, or anything about their relationship, but they are very at ease with each other, and with us, confidently winking from opposing eyes, and their mood is infectious. They know something we don’t it seems, and it looks like something fun! Interestingly, this pieces was a collaboration with Vincent doing the figures and Pooja adding the background later. 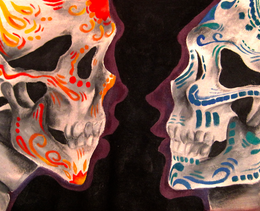 Lastly JP Stevens offers a darker take on love called Til Death Do Us Part, which draws on mexican skull art and the Day of the Dead. This evocative painting reminds us that life, love and celebration happen in the shadow of our own mortality, although one gets the feeling that despite the title these two lovers will be together well into their afterlife. John P Stevens has consistently showcased great imagination and technique throughout the season and they’ve done it again here in this final game with three pieces that tackle the theme head on, offering three very different interpretations, from the mysterious to the playful to the deep firm physicality of loving hands clasping each other in empty space. Well done JP Stevens! Remember YOU can score points for any of these teams by sharing any of their Championship Game Media on facebook, Pinterest, YouTube, Twitter, tumb.lr or your favorite social network. Or you can sign up to rate them over on the Media League website. Support your favourite Media Team!